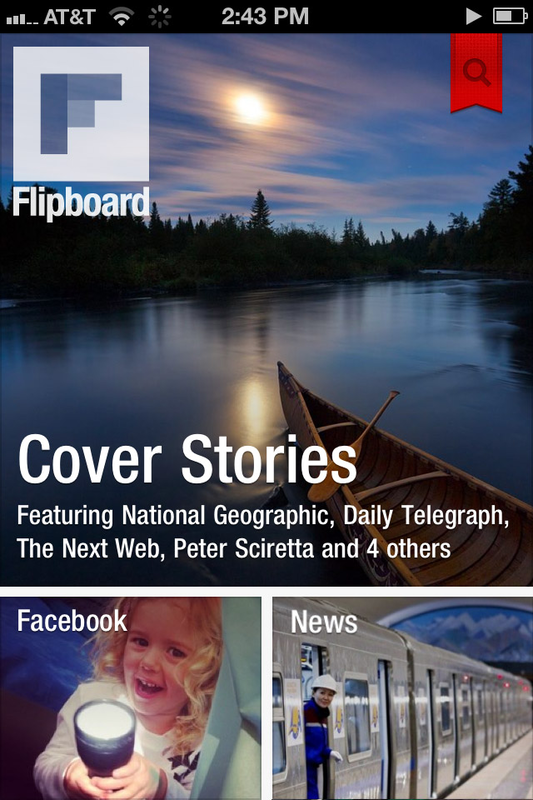 Flipboard, Zite, Msgboy, Pulse, Taptu, Poptart, Feedly. These are the names of a new-ish category of feed reader apps I've been checking out for the past two days. I really want to have a name for their category, but I haven't heard one that I like yet. For now, I'll stick with "personal magazines". Maybe not. These apps run on your mobile device, or maybe even as a plugin for your favorite web browser, or even as a plain old website. They take the most common online activities and cram it all into one place. You like to see what your Facebook friends are up to? It's there. You like to check your favorite blogs? It's there? You like to read the news, read about last night's game, or check the weather? It can all be there, and it's all integrated into a single, digital magazine, usually with a slick, easy-to-use interface. So why do I think these types of apps will be the new web? Imagine a scenario in which your Facebook friend posts a link to an article you should read (we'll think of this a recommendation, right?). You look at the photo and read the intro, then decide it's worth reading, so you click the link. The website loads and you read the article. You like it too, so you decide to share it with your other friends as well. So you click the “share” button and send it off to LinkedIn. Now you’re a star! Now you decide to visit one of your favorite blogs. You spot a headline that sounds great, click on it, read the article, look at the pictures and decide, hey, this is something my friends should read. Proud of your find, you click the “share” button and send it on to your pals on Facebook. And hey, while you’re at it why not Twitter, too? What a good friend you are. It’s time to check the news now, right? Maybe you like NPR or the Washington Post, or better yet, North Country Public Radio (‘cause you really dig smart reporting on regional stuff, right?). You read an article, maybe even listen to the audio. Yet again, you’d like to share this with your friends. Just as you start to do so, you notice one of your friends has shared NCPR’s “Photo of the Day”. So after you share that news story you decide to “Like” that photo. Nothing shows your true character like appreciation for fine quality content. Or maybe it’s late, and you just want to see what your Facebook friends or LinkedIn connections are up to before you hit the sack? You know the drill on this one - sleeping with your mobile device a lot lately, are you? Now, imagine that all of these things happened in one place, within the space of a single app. No visiting websites, no logging into Facebook, no clicking around to check headlines on three or four different blogs or news sites. And imagine it all looks and feels really cool, something like the good old days of paper magazines with glossy photos and smooth page-turns. Most of these apps even curate the content and filter it out for you to bring the cream to the top – a sort of digital DJ for content. Why would I ever leave the app if it did all of this? Two of the most common activities in which people participate when they’re online are social networking and reading blogs and news. These activities, in all their separate platforms, eventually winds up intersecting somehow. It's time-consuming and redundant, and frankly not very cool. It's all so awkward because there are too many specific apps and platforms for each individual source of your favorite information and, well, stuff. It all reminds me of the rule that says you should never buy single-purpose kitchen tools. In the long run it just doesn’t work. Your countertops fill up with Mr. Spinachwashers and Beefinators. Generalized tools that do more than one job well work better in the kitchen. Flipboard and the other apps I mention are making some pretty good progress toward becoming the chef’s knife of the digital experience. I love the idea of getting all the things I do most online done in one place, with one or two tools at most.And I love that it feels good in my hands. Feed reader apps have existed for a long time. I built a feed reader just a year ago myself, and we’ve been pushing out RSS feeds for feed readers to consume here at NCPR.org since 2002. 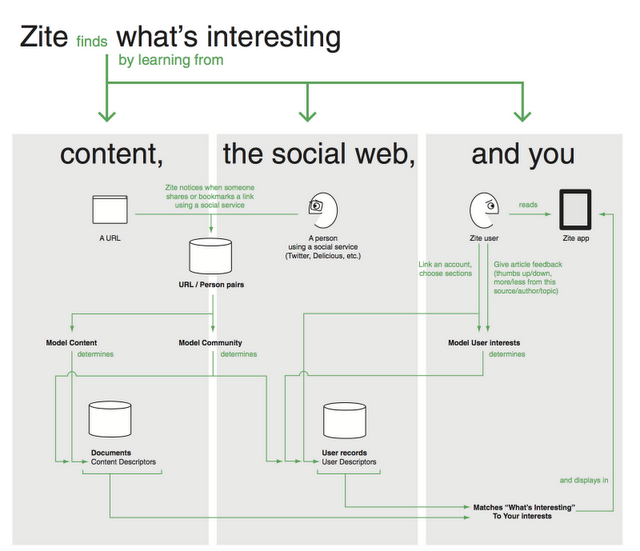 But the classic readers don’t really fully integrate all three of the very important components of the new web experience: content, social connections and aesthetic. Feedly, for example, is nice and integrates the articles with social interaction a bit. But it doesn’t yet integrate the social content with the same priority and aesthetic as the “official” content llike blogs and news. In fact, Feedly actually calls the social meat, “sidebar” content. Flipboard and Zite, on the other hand, treat your friend’s recommendations as though they’re at least as important, if not more important, than the blogs and other content. Don't your friends agree that what they think is cool is definitely more important than what the Christian Science Monitor or People magazine thinks is cool? Just the same, I’ve given Feedly a spot in my list because they’ve been doing this for a while, and I think they’re on the right track. We'll see if they catch up to the newer, slicker offerings soon. I realize people do more than just read and interact with friends when they’re online. They do, after all, often like to post something that they made themselves, rather than sharing other people's content. So there is still a reason for Google to exist, and there is (right now, anyway) still a reason to keep your Facebook app, in spite of our new chef’s knife. Google is, after all, the doorway to our relatively new worldwide, digital library of information. And Facebook, God save us, is still holding the key to the outgoing mailbox of our personal lives – until they crash themselves and the rest of the financial world, that is. I should mention that I suspect Yahoo!’s new Axis browser will undoubtedly go in this direction eventually, and Facebook is apparently looking into buying the Opera browser. Might this mean that these two companies are seeing this trend? Maybe, but I’m often wrong about these things. If you know of others I haven’t mentioned, please say so. I’m eager to find more.